Potash-lime silica glass was used for window panels in Europe north of the Alps in the medieval era. The high potassium and low silica content of this glass influences its chemical stability. When exposed to atmospheric conditions as well as acidic aqueous solutions, this type of glass can become hazy, foggy and/or flake phenomena can occur, which modify the original appearance of the artworks can occur. For proper conservation it is therefore necessary to understand the mechanisms of corrosion allowing for the selection of better conditions and treatments to slow down or avoid degradation. In previous works the applicability and the protective effect of a sol–gel silica coating on potash-lime-silica glass was tested in aqueous acidic solutions. With this work the previous results are integrated, investigating the protective effect against weathering and accelerated ageing. SEM analyses were performed to monitor the surface of the glass after accelerated ageing, in particular to detect the presence of corrosion products; moreover, ToF–SIMS analysis was performed to visualize the ion distribution as a function of depth and the presence of any changes due to the weathering treatment. The analyses showed that the formation of weathering products on the surface was slowed down significantly compared to the areas of the sample that were not coated with sol–gel. Different results were obtained depending on the glass composition. Glass was widely used to embellish churches and cathedrals with colourful window panels but it is often subjected to degradation due to its interaction with the ambient atmosphere, especially in the last few centuries. As a result of several complex processes, the glass may be not transparent anymore, may assume a hazy appearance, and a flaking phenomenon can occur, influencing the appearance of the objects and influencing its cultural and artistic value. Glass produced in Europe north of the Alps between the 11th and 15th centuries shows a different chemical composition from ancient soda-lime-silica glass probably because of the lack of raw materials or changes in trade routes; the typical glass composition of this time has an increased amount of potassium and calcium and a lower amount of silica which results in a lower chemical stability compared to glass from other periods such as soda-lime-silica glass [1–5]. It is therefore necessary to individuate the risk parameters which could influence negatively the conservation of medieval stained glass artworks and to investigate the best conditions for preserving such objects and test new methods of protection [6–8]. Several studies were done in the 1960s and 1970s [9–18] to better understand the corrosion mechanisms and parameters of potash-lime-silica glass. Extensive studies were conducted on glass of different compositions with a particular focus on soda-lime-silica glass [19–21]. Most of the literature concerns the behaviour of glass in aqueous acidic solutions. The principal mechanism for the leaching of glass occurs at low pH (<7) and consists of an ion exchange process between the network modifying ions of the glass and H+ (aq) from the acidic solution, as explained in Eq. 1. As a consequence a superficial leached layer depleted in alkali and alkaline earth ions and enriched in hydrogen is formed. The leaching is selective meaning that some ions are preferentially depleted on the glass surface depending on their charge; on the other hand the silica structure remains almost unaltered. In a secondary reaction condensation may also occur (Eq. 2) and as water is formed which can evaporate under dry conditions, the leached layer undergoes a formation of cracks. Furthermore, in some cases flaking of the formed leached layer can occur and worsen the degradation of an object. Glass corrosion depends on different parameters including the pH and the nature of the solution, the temperature, the time of exposure, as well as the glass’s composition and its morphology. For medieval stained glass objects the aspect of weathering is important. This term describes the interaction of the glass with the ambient atmosphere, including therefore parameters such as temperature, light, relative humidity (RH), acidifying gases, and airborne particles. Moreover, the possibility of variation of one or several parameters leads to a very complex situation which can represent a dangerous condition for glass objects. As a first step, the reactions occurring during weathering are closely connected to leaching; the principle of ion exchange is the same but the availability of water is different. On the surface of the glass only a thin layer of adsorbed water is available for leaching reactions due to the presence of relative humidity in the air. Additionally, acidifying gases such as CO2, SO2 and NOx may dissolve in this thin water layer causing a decrease of pH and accelerating ion exchange. In general two cases are distinguished depending on the possibility to replace the solution on the glass surface (i.e. the glass is subject to rain). In cases where water cannot be replaced, the pH on the surface increases due to the consumption of H+ ions during leaching (Eq. 1), leading to a network dissolution, the mechanism of corrosion typical for alkaline conditions (Eq. 3). A more dangerous situation occurs in the case when the glass is subjected to cycles of wet and dry conditions, which can result into the formation and dissolution of corrosion products on the surface changing the appearance of the object. All of these mechanisms have to be considered when the weathering of glass is studied. To avoid or slow down degradation processes occurring on glass windows different strategies were applied in the past: external protective glazing was installed  or protective synthetic layers were largely applied directly on the glass surfaces, such as the epoxy polyester resins and acrylics or vinyl polymers  extensively used by conservators and restorers on the basis of their experience on wall paintings. Some other products experimented with are hybrid polymer materials synthesized by the sol–gel process by several steps, using an organically modified network which can be customized to particular requirements by chemical means [8, 23–27]. All these treatments have shown promise when tested in the laboratory but show some disadvantages in long term stability such as the necessity of frequent monitoring of the temperature and humidity and low stability to UV light which leads to photo-oxidation reactions changing the properties of the organic treatment materials (solubility, colour, mechanical properties etc.). In this work a sol–gel silica coating was tested as a protective layer for potash-lime-silica glass formulated to a medieval composition. It is particularly suitable for application to cultural heritage due to the following qualities: its compatibility with the substrate (no adhesion problems), it does not require any heat treatments [28–31], it is transparent, easily applicable on the objects with a brush or by dip or spray coating, and it results in a stable inorganic layer, very thin and homogeneous on the glass surface [32, 33]. Its applicability on potash-lime-silica glass was tested in a previous study as well as its resistance to leaching attacks in aqueous acidic solutions . It was demonstrated that the coating allows ion migration from the bulk to the solution but the speed of diffusion is slowed down and no visible signs such as cracks or flaking are noticeable even after long periods of testing. One aim of this work is to test the protective effect of the same coating to corrosive atmospheres by means of an accelerated increase of SO2 content compared to the normal mean values in the atmosphere (5–30 ppb = 1 × 10−9 mol/mol). An overall aim is to continue the tests necessary to make this treatment (still in the development phase) applicable to real cases and therefore improve the stability of potash-lime-silica glass. Two kinds of potash-lime-silica glass were analysed in this work and their compositions are shown in Table 1. Sample slides (1.5 × 1 × 0.5 cm3) were prepared from synthetic glasses made at the Fraunhofer Institute für Silicatforschung in Würzburg (Germany) starting from a glass bar and progressively polished with SiC paper up to ~4 µm (4,000 mesh), details already described in the literature . The glass samples were only partially coated (3/4 of the surface) with a TEOS based sol–gel silica coating using SIOX-5  provided by Siltea S.r.l. (Spin Off of the University of Padua, Italy). The protective layer (~250 nm thick) was applied by dip-coating (drawing rate: 10 cm min−1) and dried at room temperature. Artificial weathering was performed using an air-mixing unit enabling the control of the content of SO2 and RH. The gas concentrations expressed in this paper are in ppm (1 × 10−6 mol/mol). Samples were kept for 7 days in an environment of 1 ppm SO2 and 80% RH and analysed every 24 h with SEM. In a second experiment, a more aggressive accelerated ageing was performed using 10 ppm SO2 and 80% RH for a total of 4 weeks. In total for the 1 ppm experiment seven glass samples were exposed whereas for the 10 ppm experiment only four glass samples were necessary since clear results were obtained, as discussed below. Analyses at three different areas of the coated and uncoated parts of the specimen were carried out. Investigation by Scanning Electron Microscopy (SEM) was useful for the acquisition of secondary electron images (SE) and energy dispersive X-ray analysis (EDAX), which gave elemental information about the weathering products formed on the glass surfaces [36, 37]. Time of Flight Secondary Ions Mass Spectrometry (ToF–SIMS) was performed to determine the initial stages and small variations in ion concentration at the near-surface in comparison to the bulk glass. ToF–SIMS has been used in the past mainly for studying glass corroded at high temperatures  as well as at room conditions [39–41]. Beside other techniques commonly applied to monitor H+ diffusion such as NRA (Nuclear Reaction Analysis) and ERDA (Elastic Recoil Detection Analysis), SIMS analysis were performed to study the hydration of glass [40–42] and to date obsidian and natural glass [43, 44]. ToF–SIMS is a powerful tool that allows very precise measurements, as well as a detailed reconstruction of ion distribution, but its application on insulating samples might be difficult because of the charging effect of ion bombardment. Nevertheless newer instruments are equipped with specific tools such as an electron flood gun to minimize this effect and, combined particular measurement conditions, it was possible to carry out the ToF–SIMS analyses of the samples without any conductive coating. For the SEM measurements a FEI Quanta 200 SEM was available. Samples were not coated and the pressure in the sample chamber was 70 Pa (low vacuum-ESEM). Secondary electron images (SE) were acquired at magnifications between 5 k and 20 k using an accelerating energy of 20 keV. ToF–SIMS measurements were performed with TOF–SIMS 5 (ION TOF GmbH, Münster, Germany) using a LMIG (Bi1 +, 25 keV) in positive detection with High Current Bunched Mode. Sputtering was performed with a raster size of 300 × 300 μm2 using O2 + (1 keV, ~200 nA). The Field of View used was 100 × 100 μm2 and the sampling was 128 × 128 pixels. A pause time between sputtering and measurement was set to give time for the sample to dissipate the charge; for further compensation of the charging on the sample surface an electron flood gun (20 V) was applied. Samples were not coated with an electrically conductive material and the analyses were performed immediately after the weathering. Glass samples were exposed to an atmosphere with 1 ppm SO2 and 80% RH for 7 days and were analysed every 24 h by means of SEM. The SE images depict the formation of few weathering products (see arrows) only on the uncoated part of glass M1 (Figure 1a). SE images of glass M1 uncoated (a) and coated (b), both weathered for 1 day with 1 ppm SO2 and 80% RH. The size of these corrosion products is between 1 and 4 µm, without well-defined shapes and irregular edges. They are mainly localised close to scratches caused by polishing and they appear to be flat and thin, since the underlying pattern remains visible. Furthermore, the results of EDAX analysis performed on an area with weathering products does not differ from the one carried out in an area without such products, because of their low thickness. Contrary to these results, the coated part does not show any weathering phenomena (Figure 1b). The dark spots visible in the image are due to the presence of irregularities on the surface (scratches) which were only partially filled by the coating and therefore still visible in the image. No changes could be noticed after 2 days of weathering under the same conditions for both, glass M1 and M3. After 3 days of weathering, the uncoated part of glass M1 shows a higher number of crystals that appear to be of the same dimensions as described before. The degree of weathering seems to be constant, as after 7 days of exposure no additional substantial changes could be observed (Table 1). The coated part of both, glass M1 and M3 do not depict any corrosion phenomenon at all (Figure 2). SE images of glass M1 (a) and M3 (b), both coated and weathered for 7 days at 1 ppm SO2 and 80% RH. With the aim of testing the coating under more aggressive conditions, new samples were weathered at 10 ppm SO2 and 80% RH for longer time—up to 4 weeks. 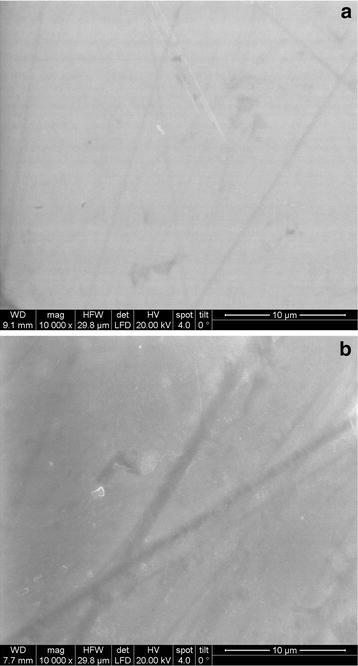 After 1 week of exposure the surface of the uncoated M1 was already partially covered with crystals, which increased in number and size with exposure time, as shown in Figure 3a, b. With SEM-EDX, the glass constituents (K and Ca) and additionally S could be detected. Literature describes the formation of sulphate compounds from which it can be assumed that these corrosion products are sulphates such as gypsum (CaSO4·2H2O), syngenite (K2Ca(SO4)2·H2O), arcanite (K2SO4), schoenite (K2SO4·MgSO4·6H2O) etc. [45–47]. Glass M3, more resistant than glass M1, shows the formation of small corrosion products on the uncoated part only after a longer time (3–4 weeks). The crystals appear smaller compared to glass M1 and are localized close to the scratches (Figure 3c). SE image of the uncoated glasses weathered at 10 ppm SO2 and 80% RH for 1 week (a glass M1) and 4 weeks (b glass M1 and c glass M3). The coated part of glass M3 does not show any weathering products even after 4 weeks (Figure 4c). On the other hand after 1 week of weathering the coated part of glass M1 depicts the formation of crystals on the surface (Figure 4a). They have a round shape and their size is smaller than 1 µm; after a longer period time of weathering up to 4 weeks, the size of crystals has not increased but rather their number (Figure 4b). SE image of the coated glasses weathered at 10 ppm SO2 and 80% RH for 1 week (a glass M1) and 4 weeks (b glass M1 and c glass M3). A previous study using ToF–SIMS demonstrated that network modifiers such as K, Na and partly Ca and Mg can diffuse from the glass into the sol–gel coating material as long as it is in a liquid state and not yet completely polymerized . The SIMS depth profiles of glass M1 show alkali and alkali earth ions in the coating, which can be the reason for the formation of crystals on the surface of the coating. Nevertheless the amount of those ions is much lower compared to the untreated glass surface , which explains the different concentration and size of corrosion products on the coating compared to the uncoated glass. Since glass M3 is more stable than glass M1 due to the lower K content and a higher amount of Si, no effect has been determined on the coated glass surfaces. In order to monitor the ion distribution migration the coating and to see if the formation of crystals on the surface corresponds to an ion diffusion in the coating, samples weathered for 1, 2, 3, and 4 weeks were analysed by means of ToF–SIMS. As described in a previous study  the sol–gel silica layer is easily identifiable by monitoring the signal of aluminium: As Al is a network former, it can be assumed to be present only in the bulk glass and it does not diffuse into the coating layer. As shown in Figure 5a, the sol–gel coating (first 250–350 nm) is rich in K and Na that migrated from the glass during the application of the sol–gel solution. ToF SIMS depth profiles of sol–gel coated glass M1 a untreated, b after 1 week and c after 4 weeks of weathering at 10 ppm SO2 and 80% RH. 41K and 44Ca isotopes signals were chosen because of the overly high intensity of the 39K and 40Ca signals. Comparing the depth distribution of the alkali (K, Na) and alkali earths ions (Ca, Mg) in the untreated and coated glass sample (Figure 5a) with the depth distribution of the coated glass specimen exposed for 1 week at 10 ppm SO2 and 80% RH (Figure 5b), it can be seen that the ion intensities of K and Na are increased close to the surface (50–100 nm), whereas Ca and Mg show no substantial differences. Additionally, no intensity changes of K, Na as well as Ca and Mg could be detected in the domains deeper than 100 nm in the coating and in the bulk glass. 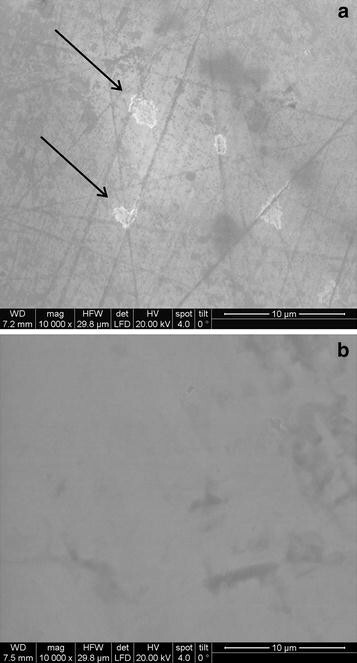 Even after 4 weeks of exposure the intensity did not change in the coating of the glass (Figure 5c). The signals at the interface between coating and bulk glass results in an anomalous signal due to the change of chemical and physical properties between the two layers, as already discussed [34, 48]. Nevertheless, after a short time, the signal reaches a stable value indicating that the bulk has been reached. In Figure 6, the depth profiles of the coated M3 glass are presented showing the lack of significant differences between the un-weathered glass (Figure 6a) and the one weathered for 4 weeks in an atmosphere with 10 ppm SO2 and 80% RH (Figure 6b). ToF SIMS depth profiles of sol–gel coated glass M3 a untreated and b after 4 weeks of weathering at 10 ppm SO2 and 80% RH. 41K and 44Ca isotopes signals were chosen because of the too high intensities of 39K and 40Ca. From the ToF–SIMS analysis it was also possible to detect the presence of small amounts of sulphur in the coating coming evidently from the weathering atmosphere (Figures 5b, c, 6b). Its distribution is more or less homogeneous in the gel layer, which can be visualized in a 3D reconstruction (Figure 7). 3D reconstruction of ToF–SIMS measurement of a sol–gel coated sample M1 after 1 week of weathering at 10 ppm SO2 and 80% RH. Each figure was rescaled for a better visualisation. The protective effect of a sol–gel silica coating was tested on two kinds of potash-lime-silica glass, one richer in K and Na and the other one richer in silica and Ca and therefore chemically more resistant. In particular the effectiveness of the coating to weathering and accelerated ageing was checked. The coating protects efficiently both types of glasses from the corrosive effect of an atmosphere with 1 ppm SO2 and 80% RH. After increasing the concentration of SO2 up to 10 ppm, no modification could be noticed for the coated part of the most durable glass (M3), even after 4 weeks of ageing. The less resistant glass (M1) showed the formation of small crystals (<1 µm) on the coated surface after the same exposure. SEM investigation has revealed that the crystals do not increase in size but in number with an increase in weathering time. Nevertheless, the protective effect is clearly visible when comparing the coated and the uncoated part of the same glass. ToF–SIMS analysis revealed that the ion distribution in the coating is not modified by a long and aggressive exposure to artificial weathering except in the uppermost domain of approximately 100 nm. Future experiments will deal with real medieval glass specimens already weathered under natural conditions and showing a weathering crust. These glasses have to be coated with the sol–gel solution and tested, in order to proof the application of this new treatment in practice. MDB carried out the studies and drafted the manuscript. HH contributed to ToF-SIMS measurements and interpretations, MS to glass stability and RB to sol-gel coating. All authors read and approved the final manuscript. The authors are very grateful to Siltea S.r.l. (Spin Off of the University of Padua, Italy) for their availability to provide and apply the sol–gel silica coating. They are also very grateful to Ing. E. Eitenberger for SEM-EDX measurements.